For oil, Vinegar, Salt & Pepper. You are buying a pair of Vintage Hornsea Pottery Bronte Coffee & Sugar Storage Jars With Wooden Lids. The jars are in good condition but the seal is worn on one of the lids. Any questions please ask. Thanks for the interest! 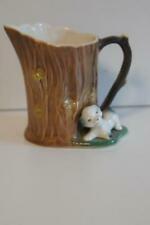 HORNSEA POTTERY WOODLAND JUG WITH PUPPY. 11CM HIGH. IN GOOD CONDITION. Ben Thomas Porcelain Hornsea England. Produced between 2001 until 2003. 1 Large Milk / Cream Jug. 1 Small Teapot. A cup and saucer by Hornsea Pottery - Silhouette design. Cup is 6cm tall x 5.5cm wide (excl handle). Saucer is 12.5cm wide. BELLEEK PRESERVE POT WITH LID PLUS SUGAR BOWL IN SHAMROCK. BLACK MARK. HERE I HAVE FOR SALE TWO PIECES OF BELLEEK IN SHAMROCK AND BASKET DESIGN. THESE ARE A PRESERVE POT WITH LID ALSO A SUGAR BOWL BOTH WITH BLACK MARK. Sugar bowl stands 6.75cm tall and has a dia. On offer is a charming cup and saucer decorated with the Fleur pattern made by Hornsea Pottery Yorkshire England, in the 1970s. The cup is 8cm in diameter by 7cm deep, the saucer is 15cm across and they are in good condition free from chips or cracks, on their base’s are the Hornsea Fleur marks. The unpackaged weight is 376 grams. Can’t find the answer?. I recycle where I can. I am also happy to accept cash on collection. I prevent breakages by wrapping parcels with care and using a size of box that allows space for protection. 5" HIGH HORNSEA FAUNA DOUBLE FLOWER VASE. SMALL 5" ACROSS POSEY HOLDER. VINTAGE RETRO HORNSEA POTTERY 583 LAMB POSY VASE 1950’s. No chips cracks or damage 11cm High 11cm At Widest. Please look closely at all the pictures before you buy. Lovely condition hornsea pottery vase/planter log ornament with cute kissing squirrels and two smaller 'fauna' ornaments set. There is a tiny crack on one of the smaller ones and a tiny chip in the back of another, please see photos, but are otherwise great. All pieces are stamped on the underside and each piece has it's own number. Numbers included in this job lot are 121, 55 and 29. On offer is an attractive storage jar for Tea decorated with the Saffron pattern, made by Hornsea Pottery, Yorkshire, England. The Saffron pattern was designed for Hornsea Pottery by John Clappison and was introduced in the early 1970s, using the same shapes as the Bronte and Heirloom designs. Please excuse any white marks on the photos they are reflection from the cameras flash. The jar is approximately 10cm tall excluding the lid by 12cm in diameter at the base, 10cm across at the rim, it is in good condition free from damage chips or cracks, but the lid seal although tight is a bit worn. On the base is the Hornsea Saffron mark. The unpacked weight is 551 grams. A rare free collection of Ridgway cup, saucer and plate trios. With their original box and original packing materials. They have had light to use, but are in Time Warp condition. One of the sources has a crack centre to the outer edge and could possibly be repaired but is fine for displaying. Prefer collection, if you would like me to ship them I can, but I'm afraid any damages incurred will be at your own risk. Thank you for looking. Made by Hornsea in England in 1975 with a Saffron pattern detail. 1 storage jar lid has a small amount of wood missing on the underside but the rubber seal is intact and seals correctly. A VERY GOOD example of 1970s pottery to use or add to your collection, as can be seen in the photographs. HORNSEA VITRAMIC. Has the Hornsea logo England Lancaster Vitramic back-stamp on the bases. "PALATINE". CUP & SAUCER. Approx sizes:Cup - 8.5cm dia. x 7cm high Saucer - 15cm dia. Designed by Mike Walker. HORNSEA STORAGE JAR FOR PARSLEY. PRODUCED BY HORNSEA BETWEEN 1965 & 1966. On offer is a Vintage squat style Milk Jug decorated with the Saffron pattern made by Hornsea Pottery, Yorkshire. The Saffron pattern was designed by John Clappison in 1972 using the same shapes as the Heirloom and Bronte designs. It is a light brown geometric pattern, with a white interior. The jug is approximately 10cm in diameter by 7.5cm deep and is in good condition free from damage chips or cracks. On the underside is the Hornsea mark and the unpackaged weight is 252 grams. Hornsea Eastgate Withernsea tree vase with cute rabbit vintage 60's no. 25. Condition is Used. Dispatched with Royal Mail 2nd Class. On offer is a large vintage sugar bowl or preserve pot with lid decorated with the Saffron pattern made by Hornsea Pottery, Yorkshire, England. The Saffron pattern was introduced in 1975 and was designed by John Clappison, using the same shapes as the Heirloom & Bronte designs. Note if buying as a replacement that shading differences did occur within the range over the years of production. The bowl is approximately 9cm tall excluding the lid by 8cm in diameter and is in good condition free from cracks or chips. On the underside is the Hornsea Saffron mark and the unpacked weight is 303 grams. See further BIG pictures of this item below. Boxes will be marked 'FRAGILE'. About Photos. I try my best to take photos as representative, as I can, of the item being sold. Approx Item Weight: kg.